There is perhaps no Vancouver Island-based artist that is more cherished than Emily Carr. More than 60 years after her death, her art is still revered, sought-after and cherished by both British Columbians and by the global art scene. Her whimsical paintings and illustrations, directly influenced by the rugged beauty of BC, capture our Province in ways no one has before or since. Known for its spectacular mural displays, the seaside town of Chemainus recently announced plans to commemorate “Klee Wyck” (as Emily was known in Uclulet) with the world’s first “MuralSculpture”. Combining two mediums – in this case sculpture with a mural – this installation will measure an astounding 45-feet-high and 20-feet-wide. Charlie Johnston of Winnipeg and First Nations carver Dennis Nyce are partnering up with Schultz to creat this unique tribute, incorporating steel fiber cement and artifacts from the Ucluelet area. The MuralSculpture is expected to make its debut in late 2012. All Canadians will have the opportunity to be part of this historic project. For as little as a minimum $5 donation, contributors can have his or her name placed onto the back of the sculpture. Families can even create their own family donation tree where each family member will be linked together. 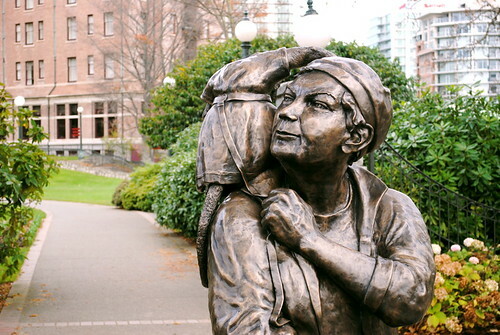 To find out how you can be included in this piece of history, visit Emily Carr Monument online. Seeing her art at the Vancouver Art Gallery a couple years ago was amazing. It wasn’t until I got home that I realized what a once in a lifetime opportunity is was to see this in person and revel in her talent.